Remote control cars have long been a classic toy for birthdays, Christmases or, if you’re a grown-up, whenever you fancy (in your face, kids). But if you’ve tired of life on the road, or just fancy trying your hand at flight, why not look to our best remote control helicopters for gifting inspiration? There are a couple of things to consider, aside from the flashy livery, when buying an RC helicopter. First, there’s the number of channels. Each one of these controls a component of the heli, so the more complex parts it has, the more channels you’ll need. 3 to 3.5-channel radios are generally recommended for beginners, and most co-axial helicopters (that’s fancy RC guy talk for ‘two rotors’) will come with them. As luck would have it, this type of helicopter is generally the easiest to fly as they’re more stable than a single rotor, so consider this the ideal setup if you’re just starting out or have younger pilots on your hands. First off, it bears mentioning that his RC helicopter looks amazing, with its army-style aesthetics and gnarly decals, but it’s far from a matter of style over substance, making it a very appealing entry-level option. With built-in gyro, it’s one of the most stable options out there, making it easier for beginner flyers to keep balance and direction, the USB makes charging a breeze, 3.5 channels let you practice simple operations, and the price is unbeatable. Our best all round. Looking for an RC heli for teens? This big bird fits the bill. You know where we’re going with this one: with two rotors and three channels, on paper, the Revell Control Helicopter Buzzard a great bet for beginners of all ages. Some reviewers recommended moving on to this after mastering a small infrared helicopter, however this model’s robust build gives it the edge for outdoor flight, as it’s more likely to survive a recreation of Black Hawk Down than a lighter mini copter, and users loved the Slow Switch for practicing precise landings. 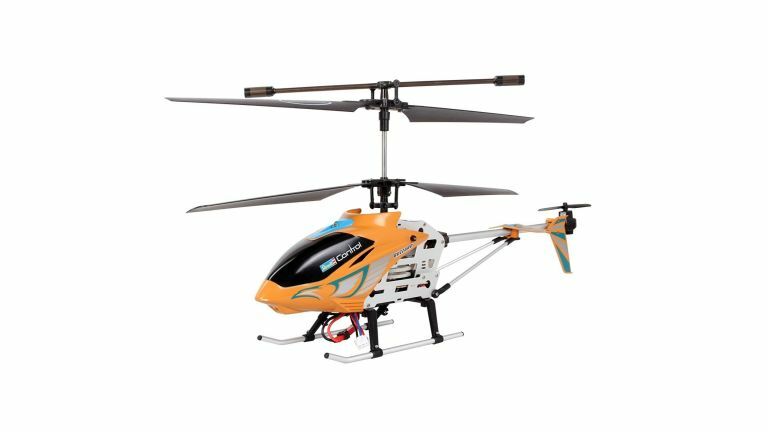 For your first foray into the world of radio-controlled helicopters, reviewers say this one from GPToys is hard to beat. Its user friendly controls and couldn’t-be-easier setup flatten out the learning curve and get you started quickly, and its 3.5 channels give scope for more complex flying once you get the hang of things. It’s for indoor use only, but that just makes it a great option for rainy days, with gyroscope stabilisation and multi-coloured LEDs to help you keep track of it. Like our GPToys helicopter, this one from Vatos is purely for indoor use; also like it, it’s a great pick for beginners. The 3.5 channels give just enough options while staying starter-friendly, the built-in gyro makes for stable flight, and reviewers said the multi-channel transmitter and heli were easy to pair, so there’s no barrier to getting started. Another vital feature for beginner flyers is a sturdy build that can survive a few crash-landings, and that this one comes with a strong polypropylene frame as well as replacement blades is a very good sign. With its diminutive size, this mini RC helicopter is our best pick for kids, although it’s a great starter for anyone making their maiden radio-controlled voyage. Very small and light, as such, a darn sight easier to keep stable than some larger offerings, it’s easy to get up in the air and keep there, and its slight build makes it easier to avoid walls and furniture. The very reasonable price and the ability of the RC to control two or more helicopters at once makes this a great one for doubling up, too – why not get hold of a couple and race?